I would like you to meet John Malin, you should know him if you don’t already. 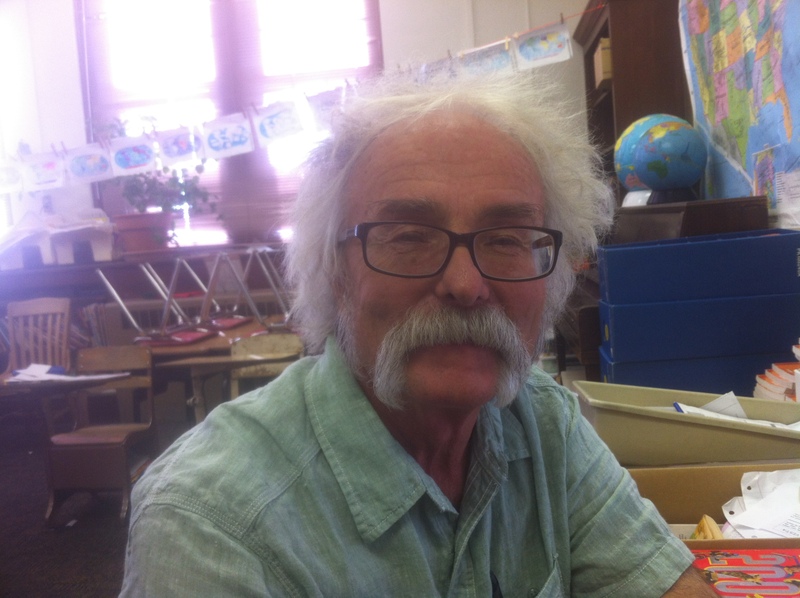 He has taught here at Monte Vista for 34 years, and had a couple more left in him, at least. His boys went to school here while he taught here, which is one of the great perks of teaching he would tell you; to be there in the day and see the unfolding of the lives of your children. There are many, many people who seek him out, to talk to him. Mr. Malin is retiring this year, he told me as he pointed to pile of papers referring to our evaluation system. “This,” he said, flapping the papers, “has nothing to do with teaching students.” Each year since the No Child Left Behind act, people with no education experience have tried to insert themselves into the classroom. Their incompetence during the Bush years made them unthreatening, but they are getting better at coming between the teacher and student. John is leaving after much success, but is facing the latest evaluation system by which administrators have all been asked to ensure that ten to twenty percent of their staff are “minimally effective” or less. Not by the virtue of their teaching skills, but by just playing the bell curve. Teachers who are at schools that are failing will themselves be ranked as failing. Administrators are asked not to allow too many of their staff be “exemplary”, and those who do will themselves be ranked low. We will be labeled ineffective because our schools were, and fulfill the political agenda of these people. In keeping up with the paper dragon they will have us feed, we will actually become ineffective. But back to John. You will remember him, because he is a good teacher. He is going away. Good teachers are going away because we are gearing the whole system to the lowest common denominator. Yes, we need to evaluate, support, and intervene with teachers who need to find their way, but to intervene with the whole of education is an incredible waste of resources. Once we have driven John and all the others like him away, we will have more long term substitutes, a position requiring less expertise, instead of people who have committed to the profession. What then? That critical question is absent from this process: what then? Goodbye John Malin. Thank you for your incredible career, and the chance I too, had to learn from you. Thanks for your career-long investment into our community. The true community is grateful for your incredible service, and these political climbers, Hanna Skandera and Susana Martinez, who have inserted themselves into your good work, have no idea what they are doing. You deserve the fanfare that these politicians enjoy, but I know you wouldn’t want it anyway. On behalf of our community, I apologize that somehow these strangers have gotten into our school, and changed your plans, and taken the experience of the students in the years you would have stayed. It makes me sad for those students, for our staff, and for myself. Your awesome ‘stache is in its glory, the chairs are up on the table, the room is waiting to be vacuumed, and this May, the door will close on your most excellent career.